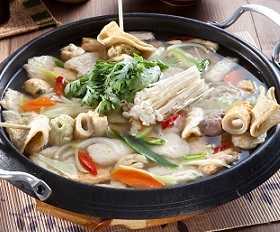 Odengguk is a popular soup made with assortment of fish cakes and anchovy based stock/broth called dashida. Often considered as a comfort meal, it is one of the most popular item sold by street vendors in Korea along with tukbokki, ojinguh tigim, and soondae. Simple and fairly quick to prepare, odeng guk is enjoyed by Koreans especially during the colder seasons and often served by restaurants as a side soup to compliment any meal. Other ingredients can include but not limited to mushrooms, garlic, onions, kelp, radish, green onion, and whole or half boiled egg. Diners may choose to sprinkle gochugaru to add additional kick to the flavor along with a popular dipping sauce made with soy sauce and wasabi to dip fish cakes.